Is the Fujifilm X-A2 Mirrorless Camera Worth It? A mirrorless interchangeable lens camera typically tries to fit in the area of the market between easy-to-use fixed lens cameras and DSLR cameras. They squeeze into that area of the market both in terms of price point and feature set. The Fujifilm X-A2 mirrorless camera does a great job of hitting this area, as it has a strong mixture of features that will appeal to beginner and intermediate.photographers, as well as a reasonable price point. Best of all, Fujifilm has shown with the X-A2 that just because a mirrorless camera is easy to use and looks great, it still can create very good image quality. All of the features the X-A2 has work great and carry a lot of value, so perhaps the biggest drawback to this mirrorless camera is the features that it's missing. There's no viewfinder (and no way to add a viewfinder through the hot shoe), no touchscreen LCD, and there are only basic movie recording options. This model probably won't appeal to experienced photographers as much as beginners, but the X-A2 is a really nice entry-level mirrorless camera that's definitely worth considering. The image quality with this model is very good compared to other entry-level mirrorless interchangeable lens cameras. It can't quite match the image quality of a DSLR camera, but with its APS-C sized image sensor and 16.3MP of resolution, it does a very nice job. Both JPEG and RAW image formats are available with this camera. The X-A2's image quality remains good throughout nearly all types of lighting conditions. You can shoot very good flash photos with this model, either using the popup flash or by attaching an external flash unit to the X-A2's hot shoe. And this model records good-looking photographs even in low light conditions where you have to increase the ISO setting. We tested the Fujifilm X-A2 with a 16-50mm kit zoom lens, and it created good images. The Fujifilm X-A2 is a fast performer compared to its peers, offering a fast start-up-to-first-photo time, good shot-to-shot speeds, and burst mode speeds of up to 5 frames per second. It does have only average shutter lag performance, unfortunately. Movie recording could be better with this model, as you're limited to 30 frames per second at full HD. And you only have two resolution options, full HD and 720p HD. Plenty of fixed lens, point and shoot cameras have many more movie HD recording options than the X-A2. Fujifilm gave this model built-in wireless connectivity, but it's not all that useful, as you only can transfer photos to a smartphone or tablet. You cannot make a connection with a Wi-Fi network when using this camera. Battery life is very good for the X-A2, which isn't always the case with mirrorless interchangeable lens cameras (ILCs) in this price range. 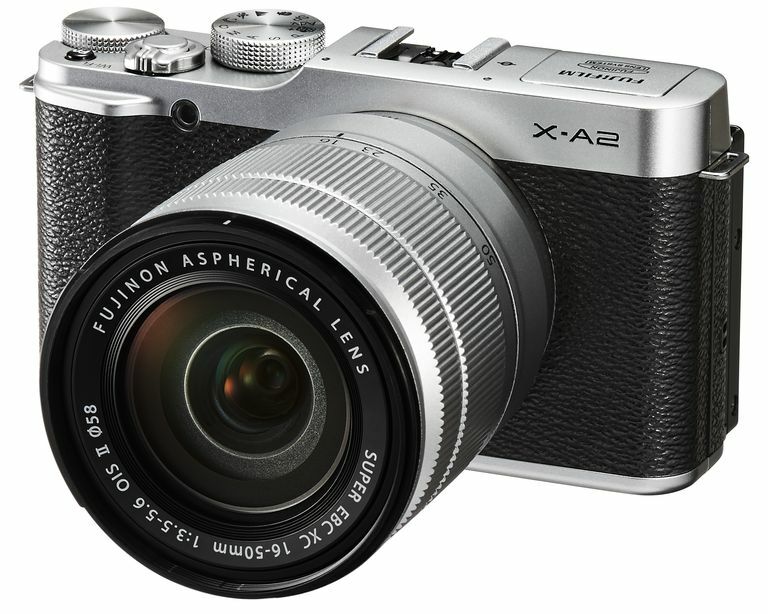 We liked the look of the Fujifilm X-A2. It's mostly a plastic camera body, but it still feels pretty sturdy. It has white, black, or light brown body colors with fake leather covering. And it has silver trim with all three camera body colors, as well as silver lenses. Fujifilm included an articulated LCD with this model, which can be tilted up to 180 degrees, meaning the LCD screen can be visible from the front of the camera, allowing for selfies. And the LCD is a high-quality screen, offering very sharp images. One aspect of the design that could've been improved is the way the photographer interacts with the camera. You have to make most of the changes to the X-A2's settings through on-screen menus, often more than one on-screen menu, which is a bit of a hassle, especially because this model doesn't have a touchscreen LCD. Or Fujifilm could have given this mirrorless camera a few more control buttons to change common settings. This issue is magnified even more because Fujifilm gave the X-A2 a large mode dial that contains quite a few scene mode options on it. We're not sure why Fujifilm included so many scene modes on the mode dial when so few intermediate photographers will be using them. The mode dial could've been smaller or could have had a few more usable icons on it. One area that will save you a lot of time in changing settings is the Q screen, where a large number of settings are listed in a grid, making it easy to access multiple settings in one location. It would've been nice if Fujifilm had provided a few more design features like this with the X-A2.